The PAHS Drama Department presented "The Nerd" by Larry Shue on Friday and Saturday in the school auditorium. 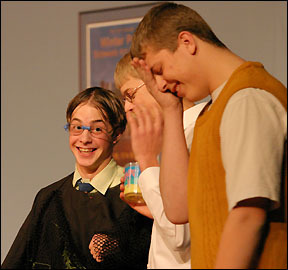 Axel Hammond (Shawn Reinke) and Willum Cubbert (Peder Thompson) react in disgust to Rick Steadman (Dugan Flanders), the title character in "The Nerd." 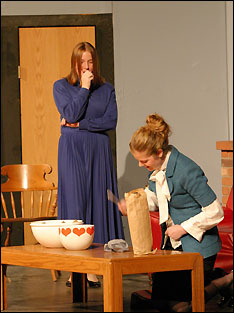 The PAHS Drama Department staged a play on Friday and Saturday nights in the school auditorium. The farce, set in Terre Haute, Ind., in 1981 centered around an architect (Peder Thompson) who is unknowingly pushed by his art critic friend (Shawn Reinke) to move to Richmond, Va., and court Tansy McGinnis (Lauren Vaske). To get his friend to leave Terre Haute, this art critic enlisted a friend to pretend to be Rick Steadman (Dugan Flanders), a chalk inspector from Wisconsin. Steadman has saved his friend's life during the war, but as "The Nerd" he moves in with his friend and makes his life miserable. A week later, after finally standing up to "The Nerd," the architect decides to move to Richmond. Cleo Waldgrave (Lindsey Pelton) breaks a glass to soothe her frustrations as Tansy McGinnis (Lauren Vaske) watches.